Fables are a popular vehicle for teaching because of their simplicity. Like song lyrics, you can superimpose yourself into the story without much effort. I put fables in a different category than other types of writing where I expect lots of character development and detail. Fables are simply not built to support that level of embellishment. What matters when you read a fable is if you were A. moved by it on a very basic level and B. if you learned something essential about the human experience. 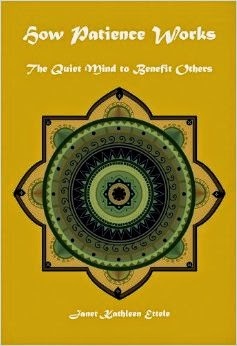 How Patience Works: The Quiet Mind to Benefit Others by Janet Kathleen Ettele (Karuna Publications, May 2014) is one such successful fable. The third in a series of tales following a young man named Troy and his girlfriend Maggie that started with How Generosity Works and How the Root of Kindness Works, How Patience Works illustrates the teachings of Master Shantideva's Perfection of Patience. According to Wikipedia, Shantideva was an 8th-century Indian Buddhist whose master work--translated as A Guide to the Bodhisattva's Way Of Life--is a timeless piece of wisdom, a long poem describing the process of enlightenment from the first thought to full buddhahood which is still studied by Mahayana and Vajrayana Buddhists today. Anger is like a bad vapor that permeates space, and the space it permeates is that of the mind. Imagine yourself captive in a room filled with a putrid stench. Then imagine that while in this room you are presented with delicious food. You would not be able to enjoy any pleasant taste because you would be overwhelmed by the awful smell. When anger permeates the mind, its negative aspects become dominant, blocking us from experiencing the sweet things in life. This passage is spoken by Mrs. Sternau, an elderly widow who every Thursday comes into the diner where Troy and Maggie work (she often flubs their names, calling them "Trevor" and "Molly.") Mrs. Sternau likes to write notes to her husband on the paper place mat at her seat, and then leave them behind like offerings to the universe. Troy secretly pockets and collects them. At first he claims it's out of respect, but then admits it's because he thinks the messages are wise and inspirational--the first indication that Mrs. Sternau will be the teacher in this fable, just as a music teacher named Grace and a Vietnam veteran named Abe were teachers in the first two fables. The problems facing Troy and Maggie are common enough--Troy is struggling to keep his cool around his shrewish stepmother, Maureen, and Maggie would like to have more control over her emotions, especially when she's confronted by rude customers in the diner. They are befriended by Mrs. Sternau, who at 80-something has successfully mastered her own emotions and is eager to share what she knows with her two young protégés. Over tea and crumpets Mrs. Sternau tells the kids about an incident that happened early in her marriage that tested the couple--and how the teachings helped them to transcend the feelings of helplessness, anger and frustration that threatened to hijack their happiness. How Patience Works is a very sweet and gentle story that beautifully illustrates the teachings of Shantideva. It's a perfect little book for bedtime, when you're trying to loosen the hold of the day's problems from your mind to find a place of peace.